Posted October 30th, 2014 by Adam & filed under Codastar News. Twitter is about brevity, so your profile needs to be able to sum you up quickly. It’s obviously another place to get your branding seen – with a profile picture and a banner – and we will work with a client to decide on whatever imagery or information they want to include to make the most of the space. Then it’s a case of introducing the firm in very brief, evocative text, including the right keywords to make sure the company appears in relevant users’ search results. Adding the firm’s location, if applicable, is also vital for this reason. Twitter offers paid advertising options that can be very specifically keyword and audience targeted, making the most of your advertising budget. 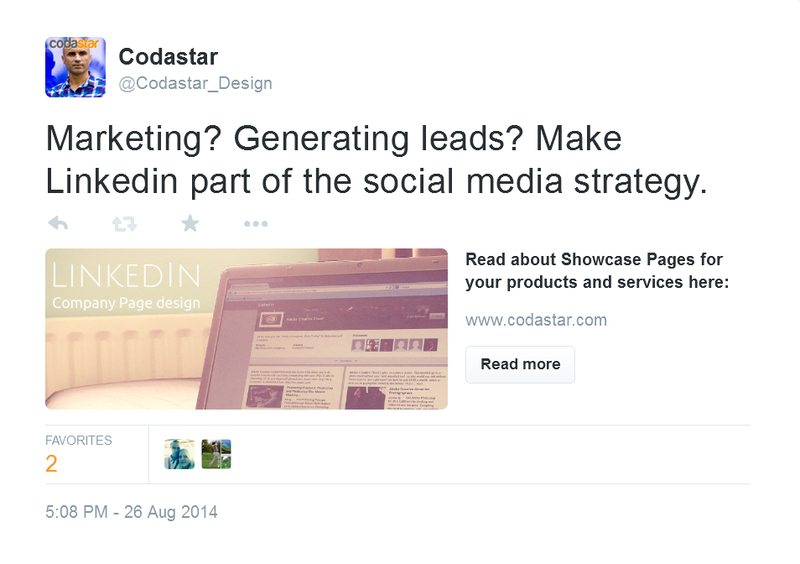 You can create adverts from scratch or promote your best tweets. Overall Twitter is a place to draw attention to yourself, saying interesting or entertaining things about your field and getting your name known. Having your profile set up right means that the people who find your comments interesting will see your branding and click over to your website to find out more. We also offer Twitter profile design as part of our social media package. We feel a set of matching banners across several social media platforms helps increase the visibility of a firm, making its branding familiar and offering a route for new audiences to find the company.